(Fibre2fashion) – Turkmenobahyzmat, the Turkmenistan Government organization, is close to finalizing a deal with American brands John Deere and Case for procurement of spare parts, lubricants, wheels and other consumable resources. 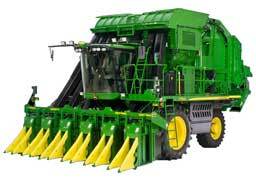 Turkmenistan has been traditionally purchasing agricultural machinery from Belarus, Germany and the US. However, in order to improve the efficiency of cotton producers in the country, Turkmenistan is planning to purchase farm machinery from those US manufacturers, whose machineries would be the most suitable for climatic and soil conditions of the country. Cotton plantation began a month ago in Turkmenistan and the country intends to reap 1.109 million tons of raw cotton from 550,000 hectares, on which the crop is sown, during the new season. In anticipation of the cotton harvest, which usually runs from August to October, prophylactic measures are currently being taken at 36 ginning units and 159 points. Last year, cotton was also harvested in November. Around 7,000 tractors, 5,000 cotton cultivators, 2,200 sowing machines and other machinery, mainly procured from the US and Belarus, are being used during the current season. During last season, Turkmenistan produced around 1.1 million tons of raw cotton, mainly from Mary, Balkan, Akhal, Lebap and Dashoguz provinces. The country traditionally exports raw cotton to Russia, Iran, South Korea, Britain, China, Indonesia, Turkey, Ukraine, Singapore and the Baltic nations. Добрый день. Хотим коммерческое предложение на John Deere Cotton 7760 4 рядный .